This honoree for the Chancellor’s Leadership Award has tutored students, served as a FIGS instructor, and been an RA for Barr Hall. Last year, as University Affairs Co-Chair of the Engineering Governing Council, she organized meetings and volunteers for the Knights Safety Watch, and created the What’s On Your Mind survey for the engineering community to voice their opinions on housing, dining, academics, recreation and transportation which was shared with University leadership. 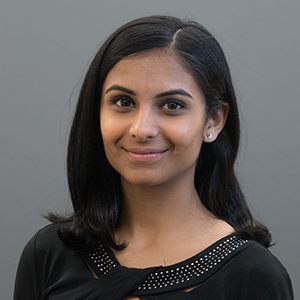 She has conducted research in Dr. Schrieder’s lab through the Aresty Research program and recently published a 2nd authored paper in the journal, Technology.